Strum up some fun easier than ever with this bluetooth-connected, app-guided ukulele. Don't give up on those rockstar dreams. 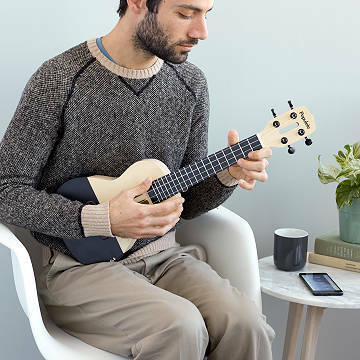 Learn how to strum your favorite songs in no time at all thanks to this real ukulele and its smart technology. With bluetooth connectivity and a corresponding app, you can choose the chords or full songs you want to play and follow along on the light-up fret board. Not only will you pick up on the music faster, but you'll have a mental image saved for how the chords will look, which helps you build up your skills. The app also lets you easily record yourself and share with friends—we have a feeling they'll be looking for an encore performance. Made in China.